Fake news has emerged as a hot topic in the wake of the US elections. But how does this translate across APAC’s diverse political and cultural dynamics for media? Given our highly connected digital community, how can the industry help people make well-informed decisions about the information they consume? What are publishers, tech and social media companies doing to address the issue in a rapidly evolving post-truth era and how can they best collaborate to solve the problem? Join us for a special SOPA Media Insiders and hear from our expert panel featuring Asia leaders from Facebook, The Wall Street Journal, Storyful and Meedan to hear about how their respective companies view the issue, and the latest advances and partnerships aimed at combatting the fake news problem. Chatham house rules to be observed: no reporting, no photo taking, no recording, no social media postings. George Chen’s career spans international media, academia, and now public policy. George joined Facebook in 2016 as the Head of Public Policy for Hong Kong and Taiwan. In this role, George works with the governments, legislators and other stakeholders on various policy issues. 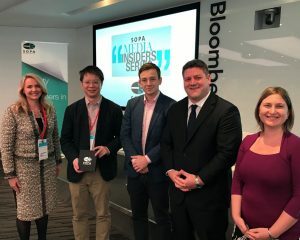 Prior to Facebook, George had more than a decade-long experience in the media sector, including being Managing Editor for the International Edition of the South China Morning Post (SCMP), and in various editorial and project management roles for Reuters and Dow Jones in Shanghai and Hong Kong. Iain Martin is the Asia Editor for Storyful. Storyful has a team of six people in its Hong Kong bureau working to discover the best stories, photos and video from social media in Asia. Iain joined Storyful in 2012 after working as a financial journalist in London since 2007. Jonny Wright was appointed Managing Director International of Dow Jones in January 2016. He previously served as Managing Director APAC and Publisher of Financial News and WSJ Pro. Mr. Wright is responsible for defining and implementing growth strategies for The Wall Street Journal and Dow Jones outside the US. Tom Trewinnard is the Program Lead on Meedan’s open source verification toolkit Check. Tom has worked extensively with journalists in some of the Middle East, US and Europe’s leading newsrooms, as well as with citizen journalists from around the world, to research the role of eyewitness media in mainstream coverage of breaking events and to train journalists in verification and geolocation techniques. Tom leads Meedan’s participation in First Draft News, was a contributing author to the Verification Handbook, and curates the weekly verification newsletter The Checklist. Moderator: Anne Kruger, Cyber news verification lab manager, HKU Lecturer, edX and Coursera MOOC presenter/instructor. Anne Kruger has diverse leadership and senior level media experience spanning twenty years as a journalist with world-class media organizations including Bloomberg TV, ABC TV (Australia), CNN International and currently the University of Hong Kong. Anne is Lecturer and Head of Digital Broadcast at HKU’s Journalism and Media Studies Centre. At HKU, Anne founded and directs the Cyber News Verification Lab, the first J-School verification lab of its kind and scale in Asia.